MOUNTAIN VIEW, Calif. — (BUSINESS WIRE) — March 26, 2019 — Elastic N.V. (NYSE: ESTC), the company behind Elasticsearch and the Elastic Stack, announced the general availability of version 6.7 of the Elastic Stack. This release delivers two new solutions: Maps, for advanced, layered visualization of geospatial data on a map in Kibana, and Uptime, a new way to monitor system and service uptime with Elasticsearch and Kibana. Elasticsearch 6.7 also introduces the production-ready versions of many features, including cross-cluster replication, index lifecycle management, Elasticsearch SQL (including ODBC and JDBC clients), Canvas, and Functionbeat. Elastic Stack version 6.7 is available on Elasticsearch Service on Elastic Cloud, or users can download it for self-managed workloads. The Elastic Maps solution allows users to view and explore this location data in a more intuitive way. 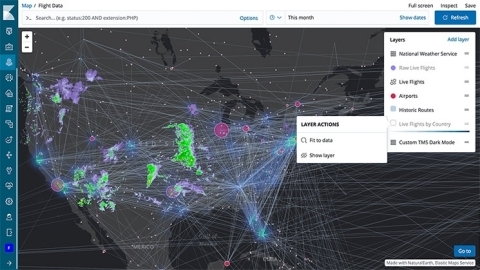 With features like multiple layers and plotting individual data points and shapes, with many options for customization, this solution improves on Elastic’s existing geospatial visualizations. Elastic Maps is launching in beta with the 6.7 release, and is included in Kibana by default, which means it's available today in Elastic Cloud.